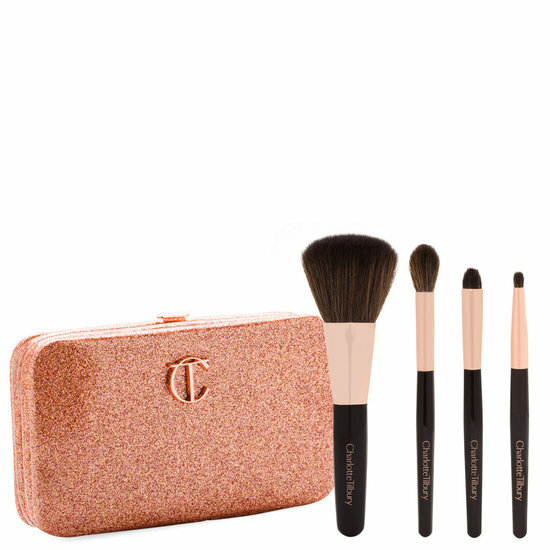 Featuring travel-sized versions of Charlotte’s best-selling complexion brushes, the 2nd Edition Mini Magical Brush Set is the perfect gift for the makeup aficionado in your life. This portable brush set comes with a glamorous gold glitter clutch big enough to carry all of your beauty essentials—a perfect accessory for any party outfit. Eye Blender Brush: the perfect brush for applying a subtle wash of color to your eyes, ideal for softening a smokey eye and building drama with eyeshadow. Eye Smudger Brush: a clever little brush for applying color to add definition in targeted areas such as along the socket line or even along the lash line. Lip Brush: apply lipstick with perfect precision for a kissable pout. This lip brush has a specially designed square end for even coverage. Apply powders with the blusher brush, create natural and smoky eye looks with the eye blender and smudger brush, and create a defined pout with the lip brush. Lets start wit the case, case is smooth waterproof plastic, not a rough surface with glitter pieces glued on it as what I thought before buying. It is an elegant and handy set for holidays. Case can be used for carrying some cards and notes as well. Blusher Brush: I have not tried full size before. So far this works the best for me in this set. It works gorgeously for me in highlight, bronzing, blushing and powder setting. The experience got me to wait for full size to be in stock. Eye Blender Brush: Bristle's shape, texture and performance are very different from full size. Unlike full size, it's very weak in picking up color and application. I tried using it for shading nose, it works better since it picks up powder lightly so it will not over shade but size is too small for this function. Good that bristle is soft comfy without irritation still. Eye Smudger Brush: Bristle is still soft without irritation. This one seems to be weak in both picking colors and application as well. Lip Brush: I am not really a lip brush person but I tried using it to shape lip. It works fine on me. I was generously gifted this for Christmas, and I am so glad I was because it's something I wouldn't have picked up on my own. All these brushes work great for me, and I find that I can nearly create a full look with just these (I added a disposable spoolie and a miniature flat shadow brush to the case to round it out). The largest brush can be used for any and all powder applications. I did not realize that the smallest brush was a lip brush; I have been using it to smudge out eyeliner and it works great for that (not sure I would want to use it as a lip brush as it would be more likely to get the inside of the case dirty and is a bit fussy for a travel kit). I also love how well the case protects the brushes: you can just throw it in your carryon and not worry about it. Overall, if you travel frequently, this is a great little luxury that will make your life easier.